Derbyshire UK 1973. The Alport Castles Love Feast is held annually on the first Sunday in July. 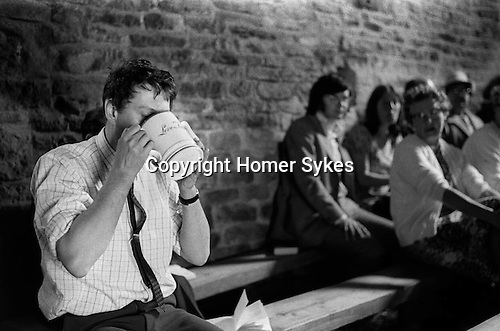 In the 1970s a Loving Cup was passed around the congregation. The tiny and remote hamlet of Alport is rarely visited, apart from on the first Sunday of July. Because of its isolation it was a favoured place where non conformists worshiped, especially when their practices were made illegal under laws passed in the early part of the reign of Charles II. About one hundred years later John Wesley the Anglican minister and theologian and one of the three founders of Methodism is reported to have preached here on several occasions. The Love Feast is derived from feasts of charity in early Christian times when the wealthy brought food for the poor. The simple contemplative Methodist service takes place in a large barn attached to the Alport Castle Farm, and is thought to have been held here continuously for over 250 years. It is said to commemorate and perpetuate the non conformist tradition in these parts. During the service of unaccompanied hymns, water in a two-handled Loving Cup is passed amongst the congregation along with fruitcake, instead of the usual communion of wine and wafers. The house also has a history being the birthplace of Hannah Mitchell (b1871) who despite only two weeks schooling became a Suffragist, founder of the Manchester labour movement and wrote her memoirs in a book called 'The Hard Way Up'.